For those of you who wanted to know the progress of my book, well I finally was able to install the software to do the design. I can confess enough how much of a stress it was, trying to lay hands on the software to do the designing. When I finally installed it successfully, I was feeling so light as if I have the entire part done. Well I know the big work starts now. On the recipe part, I am so tempted to include so many but will again have to audit on how many to take in and include for later. Coming to the recipe for the day, it is a sweet dish that Amma made the other day after getting inspired by the telly. There are so many cookery shows in the TV these days that one can get worked up seeing so many aired at the same time. Most times it will be a fun thing watching Athamma or Amma trying to watch all the shows in one go. They check out one show, if it is not good, switch to the other. They simply watch for the fun of shows as most never get to be done nor even being jotted down. But they do attempt at dishes when it calls for ingredients that are readily available with them like this one. Amma adapted this to suit her way of cooking. Heat a pan with ghee and roast the vermicelli till golden in colour. Keep it aside. Then roast the nuts, raisins and remove. Boil the milk and add the vermicelli, simmer till done. Add sugar and stir well to get the sugar dissolved. Simmer and continue to cook till the vermicelli is done and the milk is all evaporated. At this stage add the grated coconut and mix well. When you find the mix is coming together, you can add the roasted nuts and raisins. Grease a plate with ghee and quickly spread this mix over it. Cut into diamond shaped Burfis and decorate with nuts if you want. This made a good one to make when you are in a hurry as it gets done really fast. Silky temptation of thin finely roasted Vermicelli, cooked over slow flame with milk boiling to thickness though not enough to cut through with knife, sweeten with a bowlful of sugary granules, thicken with pristine white, flowery coconut that was grated with a swollen elbow, that tastes to juicy if you sneak in between the cooking, crowned with jewels enough to put a ruby to shame, that swam in a hot oil to balloon twice its size and with a nutty taste of the cashews in between. If you had removed a while before it would have been called kheer, a moment later it evolves itself as The Burfi! Chayote Halwa ~ Chow Chow Halwa! 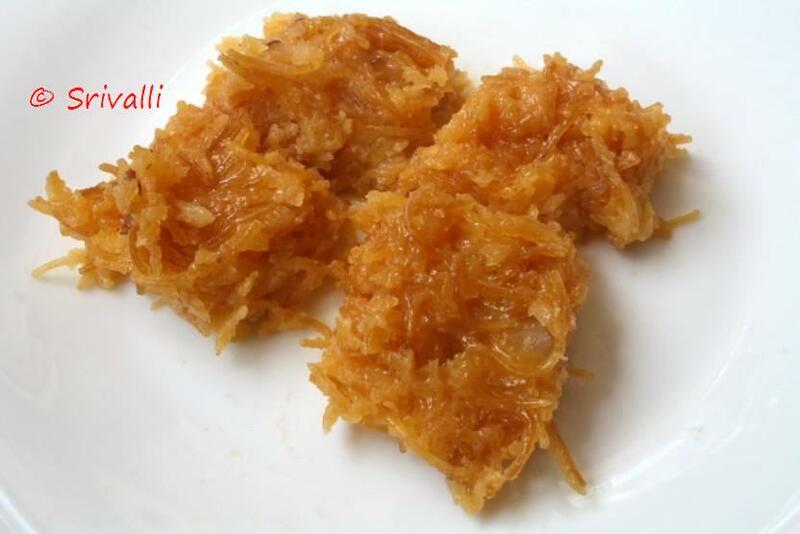 srivalli another sweet dish..nice choice.seems its very simple one.. I liked that florid description at the end! BTW, you forgot to add in "fry raisins" in the recipe directions. 🙂 That burfi is new to me- sounds so good! I am curious what the texture is like now. Nice combination of vermicelli and coconut.Loved the para describing the dish. vermicelli and coconut seems to be a winning combo. Loved the description. Enjoyed reading your pongal and chutney ones at FB. You can think of adding this to your cookbook too. Thats a beautiful burfi, never tried this combo..looks awesome..
Pel, I thought I assumed raisins when I mentioned nuts..:)..updated now..sure that is already planned..thanks for the suggestion. I had to smile thinking one of the twin not talking to Athamma 🙂 they indeed know how to get hir back home. I record cking programmes and watch when i have time thanks to the Diggi box. Hand always remark why you watch the programmes you never cook anyhting from these shows. I am so glad you liked it Jayasree…thanks for suggesting that, I am really so happy to know it might be liked..let me work on that.. Thanks Priya, coming from you that is really such a lovely thing..:).. Your barfi looks really nice.. very unusual ingredients! You are putting together a book of your recipes? That should be very interesting. Look forward to hearing more about it. i love burfi's. But never tasted one with vermicelli, yours sure is an unique recipe. Love to try it sometime. hmm.. nice. i make this without cocont, but coconut is always welcome in a sweet. how did u get ur looking so nice and golden? This is just sinful – but I would not mind eating a few of these in a sitting!